A long time ago, back in the 1980’s, I ran Advanced Dungeons & Dragons for my High School friends. There was a shifting group of us, but as it finally fell out, after some comings and goings and character changes, there was a group of seven of us. Six player characters and me, the DM. I started people out with the basic dungeon crawl. 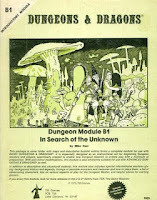 I quite unoriginally started with B-1, In Search of the Unknown, as the first level of my dungeon. Other levels, carefully hand drawn, with room contents filled out in a key in a spiral notebook followed. 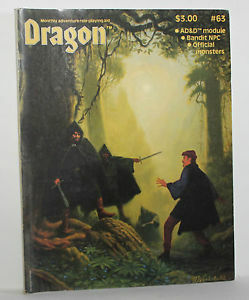 There was not a lot of logic to it all, but that was early AD&D. The rooms usually seemed to be set pieces, often unconnected from one another, waiting for the entry of the player characters to trigger them. 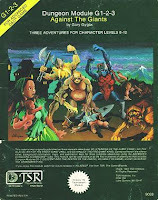 They also had some adventures in town, some trouble with the thieves’ guild (the Monkey Guild as I recall), faced an initial incursion of mysterious humanoid feline invaders (Larry Niven’s Kzinti from Dragon 50) and some dealings with a powerful mage named Xanthius. I was using my own “world” sort of. I was both too cheap to purchase The World of Greyhawk materials and too proud to think that I needed them, but I was using Greyhawk Deities and was heavily influenced by Gary Gygax’s published campaign. 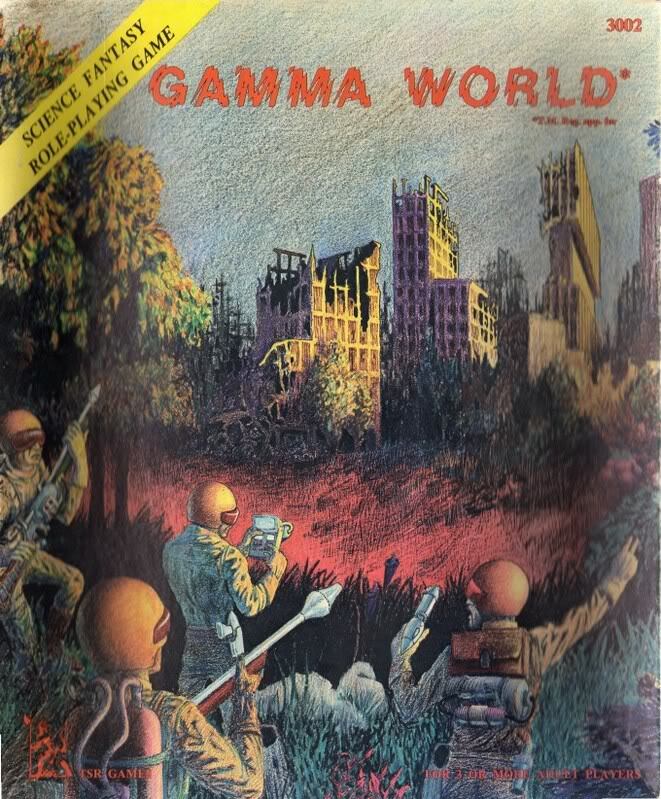 I never had much coherent world building, and we might as well have been in Greyhawk. Two High Elven Cavaliers (Antani and Lars) (each started after the write up in of the Cavalier Class in Dragon 72, and then formalized by Unearthed Arcana). Two Half-Elven Ranger/Clerics (Daniel van Rigir and Cheltenham). One Half-Elven Fighter/Cleric (Degius Le Gudrius). And one Human Paladin (Caladin, yes, Caladin the Paladin). One note on the Paladin. Caladin came into the game because of a rules quirk. His player had originally been playing Farl the Barbarian (who always wanted to go East). 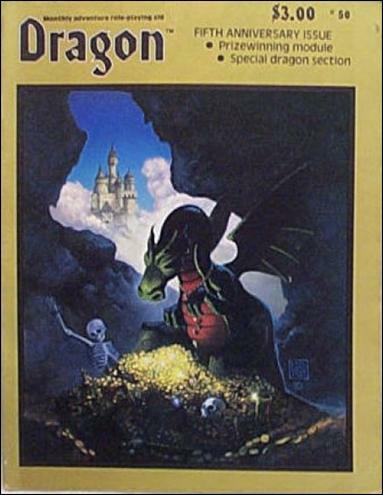 We developed Farl after the Barbarian class was published in Dragon 63. It was a class that got tried out a lot after its initial publication. 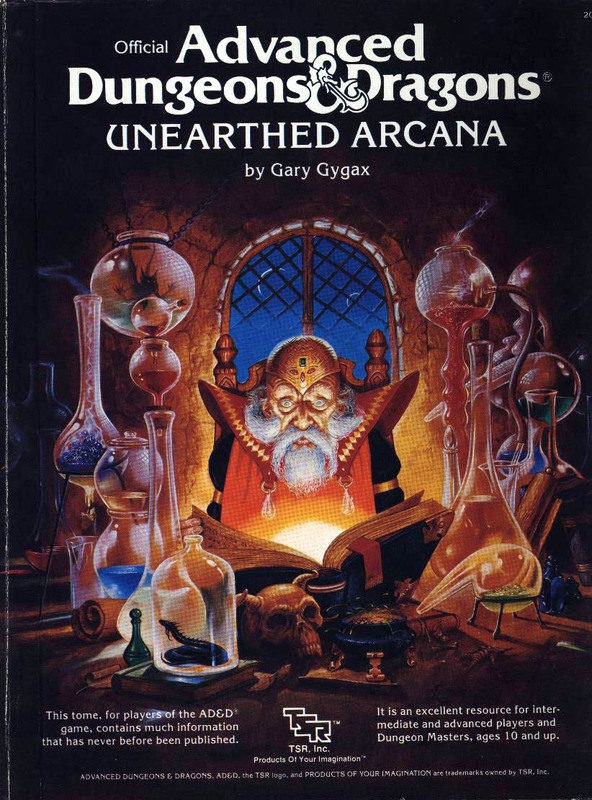 However, as written, the original barbarian character and the revised final version published in Unearthed Arcana, was a hater of magic. As you will see below, that became a problem, and rather than house rule away that issue (especially since it had been a role playing point), we had the player swap Farl for Caladin. Farl went East. Eventually, we came to the point of needing more of a focus for the game, and thus was born my quest. The Nine Vessels of Magic were the focus of the quest (thus the need to jettison Farl the Barbarian given the way the class was written then). The quest was straight forward and unoriginal. Long ago, a great Elven Wizard had forged the Nine Vessels of Magic, each one embodying one of the archetypical forms of magic, in order to help protect the Elven Realms. Also long ago, the Vessels had been lost. Now, a dreadful Lich, Kantorek, had discovered the lore of the Vessels and was seeking for them. He was already massing forces for a great war of conquest against the realms of the living. With the Vessels, he would be (wait for it) INVINCIBLE! The Elven Emperor, impressed by the deeds of the two Elvish Cavaliers and their companions, charged the group with the retrieval of the Nine and frustration of Kantorek’s plans, if not his outright defeat. I decided, as I was railroading them into this, that they might also need some magical support, so I contrived to place an NPC with them, creating the youthful daughter of the Emperor as a talented magic user and having her become infatuated with one of the party members, Degius. The princess’ name was Krystella. I already admitted this was not the world’s most original story. Along the way, there were a few guest stars. A Druid who came in and out of the story as my cousin visited, and a thief (another lack in the party), played by a friend of one of the players, but who eventually decided not to come back (or we decided not to invite him back, that is hazy). 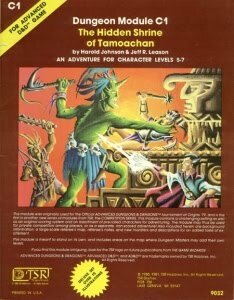 As they sought the Vessels, they battled pirates, they fought armies of goblinoids, they played through my modified version of The Hidden Shrine of Tamoachan, and they ended up in a quasi-Spelljammer before there was a Spelljammer setting, as they fought Mutant Orcs on a spaceship (also heavily influenced by Gamma World). 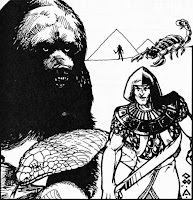 After that ship crashed, they ended up in a quasi-Egyptian setting and gained the help of Isis (I was going through several chapters in Deities & Demigods). 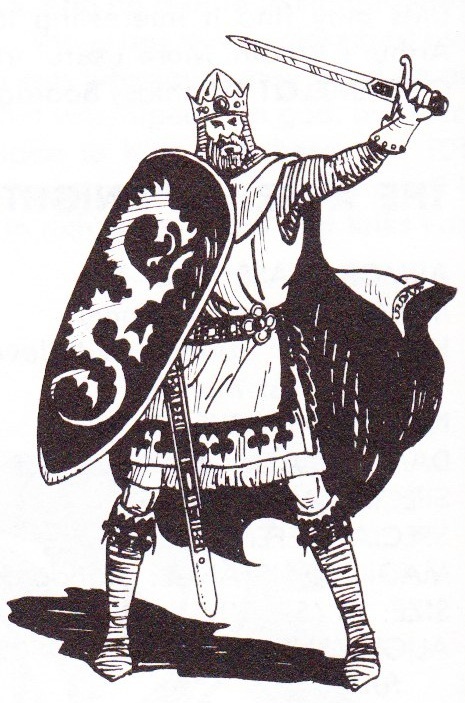 As we wound down the campaign they went through modified versions of the G-Series (Steading of the Hill Giant Chief, Glacial Rift of the Frost Giant Jarl, Hall of the Fire Giant King). I ended up throwing one character, Antani (one of the High Elven Cavaliers) ahead, into my twisted version of the Arthurian stories. The character ended up married to my version of Mordred. As it turned out, there was Mordred and a “Dark Mordred” (ala Dark Phoenix as far as inspiration). The rest of the party arrived afterward, and, of course the version of the Holy Grail in this reality was one of the Vessels. There was a Cathedral to the Grail, guarded day and night by Sir Galahad. However, he then was murdered, shortly after the formal announcement of the marriage of Antani and Mordred. Mordred and Antani were arrested in their quarters, a bloody dagger in Antani’s hand. 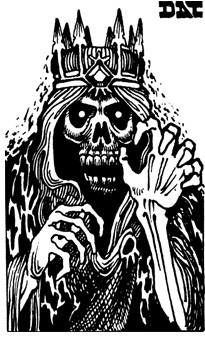 The party participated in the trial before the King, and at that event, Mordred, seeming extremely evil, revealed the affair between Lancelot and Guinevere, and then as Lancelot sought to flee with the Queen, Mordred used magic to cause Lancelot to kill Sir Gaheris and Sir Gareth. 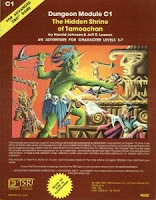 The extreme chaos essentially cleared the room, the player characters seemingly forgotten. Then, in an even bigger reveal, Mordred split, with his evil-self free and the man the player character loved still in chains. He swore to destroy Camelot and Arthur and laughed at the thought that his good twin was to die for his crimes. He then disappeared. The characters managed to talk their way out of Camelot, take the Grail, take the “good” Mordred. With the help of the spirit of Merlin, they boarded a mystical ship and set sail towards their final confrontation with Kantorek. In that crossing, both Krystella and Mordred were lost and taken prisoner by Kantorek when the ship foundered. The characters each received a boon on the Isle of White Magic from an Angel of Light. Somewhere along the way too, Antani found that she was in the early stages of pregnancy. Then they went into the final confrontation with Kantorek. There were some individual tests, then a big combat. 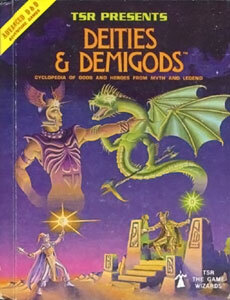 In the end, Degius was dead, and Antani ended up cleaving Kantorek in twain. Unfortunately, he was also able to break his Staff of Power which killed Caladin and caused Antani to be cast into the multiverse, lost and sundered from her friends and her true love. 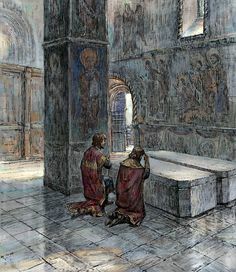 Caladin was later entombed (prophesized to return some day), Mordred and Lars set off to find Antani, Daniel and Cheltenham got Degius raised from the dead, and Degius and Krystella finally married in our quick end game discussion. That final game was in 1987. 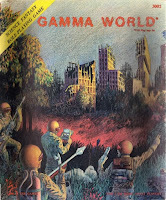 In about 1988, I wrote a long epilog, from the perspective of the long lived Krystella, which narrated the end of most of the company. That is the official and unchanged end to the campaign which became known as the Nine Vessels of Magic. There was triumph and sadness and some things that just did not get resolved. I have had regrets about that campaign. 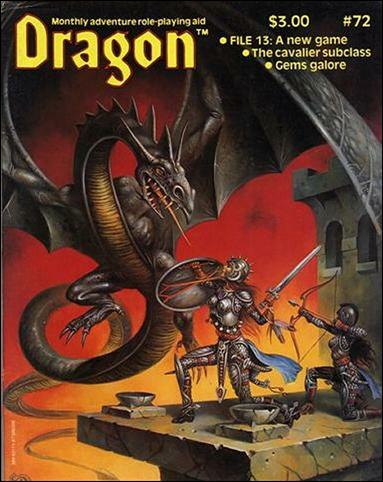 It was basically the thing I had to do to get a lot of mistakes out of my system, be a bad DM to try to learn to be a good DM, and a way to experience and understand a lot of lessons that others had tried to teach me, but you don’t get until you have tried and experimented with stuff. I also remember it with extreme fondness, for all its flaws, especially for the time I got to spend with my friends. It inspired character art and a lot of other creativity in my friends, which was both gratifying and a lot of fun. After that campaign ended, we all headed out our different ways, and frictions and fractures that had perhaps always been there surfaced more. We never got back all together to game again. That stage of our lives was over. And if that was all, it would still be enough. But I am thinking of writing another chapter or two. And with the wisdom of hindsight, I should think a have a twist here or there to add. I'll have more to write soon.